Dr. Zellner’s research involves understanding the impact history of the Earth-Moon system. She studies the geochemical and chronological information obtained from lunar impact glasses in order to understand how many impact events the lunar surface has suffered. This information can then be applied to understanding the impact rate in the Solar System in general, as well as how impact events may have affected life’s origin and evolution on Earth in particular. 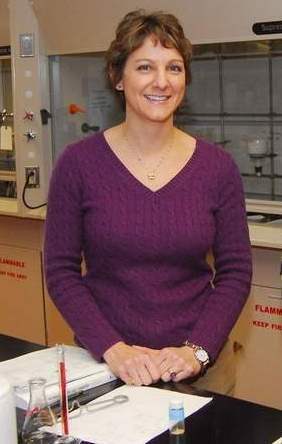 She is also interested in understanding how biomolecules are transferred among planetary bodies, such as via comet or asteroid impacts, and how their chemistry may change in an impact event. She is currently an associate professor of physics at Albion College (Albion, MI) and affiliated with the New York Center for Astrobiology, a NASA Astrobiology Institute, and her lunar research is supported by NASA and the NSF. Her impact research is supported by NASA and the NASA Astrobiology Institute. Both projects have additionally been supported by Albion College faculty development funds and by the American Astronomical Society. Nicolle also maintains a personal blog and is active with both the Committee on the Status of Women in Astronomy and the Women in Planetary Science communities. We hope we can foster more collaboration in the future, and spread the word about the resources that are available (to avoid reinventing the wheel!). McCaffrey V. P., Zellner N. E. B., Waun C., Bennett E. R., and Earl E. (2014) Reactivity and Survivability of Glycolaldehyde in Simulated Meteorite Impact Experiments, Origins of Life and Evolution of Biospheres, in press, DOI 10.1007/s11084-014-9358-5. I met with Nicolle at the October, 2013 Division of Planetary Sciences Meeting in Denver, CO.
How did you first become interested in astronomy or planetary science? In 4th grade I gave a talk on constellations as an extra project, and in 5th grade my family took a vacation to Hawaii where we visited the Bishop Planetarium. I learned how the Polynesians used the stars to navigate to the island of Hawaii. I think this is when I knew I’d have some career related to space. My parents encouraged me to do what I wanted to do, and for whatever reasons I wasn’t discouraged by the societal pressures that sometimes affect girls who like science and math. How did you choose your current institution? I enjoy teaching and did not want the pressure of having to support myself on soft money. When my post-doc position at Lawrence Livermore ended I decided to pursue an academic job. I was also looking in a more limited region of the country. The small school atmosphere at Albion is very welcoming and allows me to get to know the students on a personal level. Did you know you were interested in a teaching institution, and that is why you did some teaching earlier on? I taught at Siena College when I was a graduate student, and I taught in the graduate program at Rensselaer Polytechnic Institute (RPI). I received one of the TA teaching awards so I think that encouraged me. I also knew I didn’t want the pressure of a large research institution, and having to write large proposals to support graduate students and postdocs. I thought one way to encourage students to study STEM was to teach at an undergraduate institution. Even if I couldn’t help everyone become physicists for their career at least I could help them be scientifically literate and promote the ideals that are supportive to astronomy and planetary science. I teach intro astronomy for non-science majors, intermediate/advanced astronomy and planetary science, modern physics and theoretical mechanics for physics majors. I usually teach 6 classes a year. I also teach physics of the environment for non-science majors and an astrobiology course for Honors students. How are undergraduates involved in your research? My undergrads work on a wide variety of projects. I am THE astronomer on campus, and people who have been around the college for a while still call me the “‛new John Williams’” even though he retired over 11 years ago. I have undergrads using the telescopes on the roof; I have students doing data analysis with the lunar samples; and I have students who sort through my lunar samples and do some sample selection. I also work with the chemistry majors, in collaboration with a faculty member in the Chemistry Department, on the research project involving impact experiments. We use the flat plate accelerator at Johnson Space Center (JSC) to shock organic molecules then analyze the samples. Students have been funded to travel to conferences as well as to JSC. The astrobiology research was funded by a small research grant from AAS and we also got supplemental funding from Albion College, allowing us to be able to do experiments that showed proof of concept. We then applied for a grant through the NASA Astrobiology Institute Director’s Discretionary Funds, and eventually received funding through the NASA Exobiology Program. We thought that starting off with smaller grants and showing we could do what we proposed was a great way to build up to submitting to the high-level competitive grants. Is there anything you wish you had negotiated for with your current position? Depending on the size, liberal arts colleges can be limited in negotiations. In retrospect I should have asked to see the class schedule and would have negotiated a different selection of courses, since the teaching load itself was fixed. Do you have any advice for students and post-docs just starting their career in space science? If I had any advice it would be to follow your heart, your passion, what it is that really gets you out of bed in the morning. The current post-doc, funding, and academic job climates are tough right now, but I think they’ve always been tough. I remember hearing about these kinds of issues when I was an undergrad. I wanted to study space science, though, so I stuck with it, and now, I’m pretty happy with where I am. I never thought I’d get to work on a shuttle mission (STS-67), go to Antarctica (with ANSMET), or take two once-in-a-lifetime trips to Australia… all in the name of science. I’ve also been able to meet and work with some really interesting people, including astronauts, cosmonauts, and Nobel Laureates. Our scientific training makes us valuable – we write, we budget, we speak scientifically, and most of us also interact with the public at some level. These skills can open a lot of doors, so develop them. I’m glad that I worked at an observatory as an undergrad and got to participate in outreach activities for girls in science. I’m also really glad that I had a few adjunct instructor positions so that I could hone my teaching skills and obtain that kind of classroom experience. ← Congratulations to new (and not so new) Graduates!